1.1 This specification covers sesamless and welded steel line pipe. It includes standard-weight and extra-strong threaded line pipe. It includes standard-weight and extra-strong threaded line pipe; and standard-weight plain-end,regular-weight plain-end, special plain-end, extra-strong plain-end, special plain-end, extra-strong plain-end pipe; as as well as bell and spigot and through-the-flowline(TFL) pipe. 1.2 Dimensional requirements on threads and thread gauges, stipulations on gauging practice, gauge specifications and certification, as well as instruments and methods for inspecition of threads are given in API Standard 5B and are applicable to products covered by this specification. Grades covered by this specification are A25, A, B, X42, X46, X52, X56, X60, X65, X70, and X80 and grades intermediate to the Grades X42 and higher listed (see note). The chemical composition and mechanical properties of intermediate grades that are subject to agreement between the purchaser and the menufacturer must be consistent with the corresponding requirements for the grades to which the material is intermediate. Note : The grade disignations used herein for Grades A and B do not include reference to the specified minimum yield strength. Other grade designations used herein comprise the letter A or X followed by the first two digits of the specified minimum yield strength. 1.3 Pipe manufactured as Grade X60 or higher shall not be substituted for pipe ordered for Grade X52 or lower with-out purchaser approval. 1.4 Although plain-end line pipe meeting this specifiecation is primarily intended for field makeup by circumferential welding, the manufacturer will not assume responsibility for field welding. 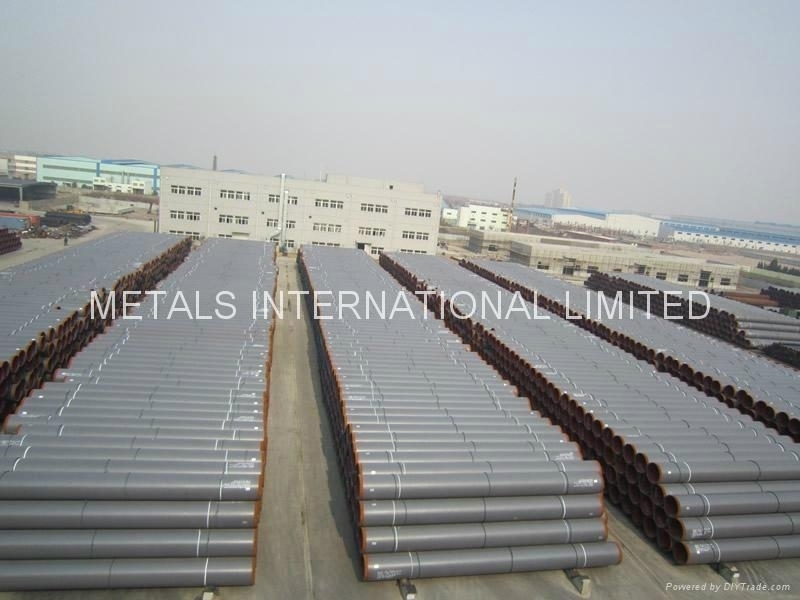 1.5 For regular-weight and special plain-end pipe(special weight) whown in Tables 6A, 6B, and 6C and for standard weight threaded pipe larger than nominal size 12, the size designations used herein are outside diameter sizes. For all other pipe, the size designations are nominal pipe sizes. In the text of this specification, pipe size limits(or size ranges)are outside diameter sizes except where stated to be nominal. These outside diameter size limits and ranges also apply to the corresponding nominal sizes. 1.6 Class Ⅱ steel is rephosphorized and problbly has better threading properties than Class I. Because Class Ⅱ has higher chemical properties than Class I, it may be somewhat more difficult to bend. 1.7 U.S. customary units are used in this specification; metric(SI) units are shown in parenthese in the text and in many tables. See Appendix J for specific information about rounding procedures and conversion factors. a. Carbon, manganese, phosphorus, sulphur, and silicon. b. Columbium, vanadium, titanium, or combinations thereof, if added during steelmaking. c. Any other alloying element added during steelmaking for other than deoxidation purpose. *For Grades X42 through X65, for each reduction of 0.01 percent below the specified maximum carbon content, an increase of 0.05 percent above the specified maximum manganese content is permissible, up to a maximum of 1.45 percent for X52 and lower and up to a maximum of 1.60 percent for grades higher than X52. cColumbium, banadium, titanium, or combinations thereof may be used by agreement between the purchaser and the manufacturer. dColumbium, vanadium, titanium, or combinations thereof may be used at the discretion of the manufacturer. eFor cold-expanded seamless pipe size 20 or larger, the maximum carbon content shall be 0.28 percent. fOther chemical compositions may be furnished by agreement between purchaser and manufacturer. gFor Grade X65 welded pipe size 16 or larger with a wall thickness of 0.500in. 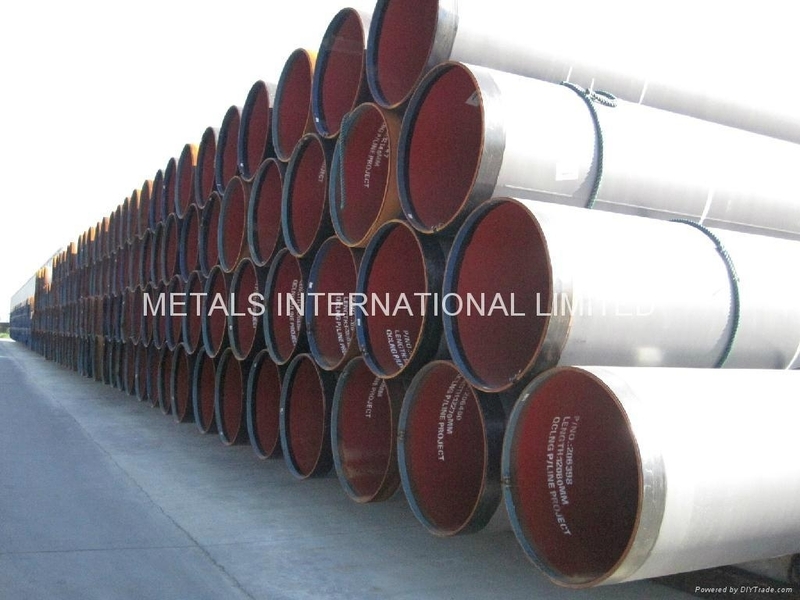 (12.7mm)or less, the chemical composition shall be as shown or as agreed upon between the purchaser and the manufacturer, for all other sizes and wall thicknesses of such pipe, the chemical composition shall be as agreed upon between the purchaser and the manufacturer. hFor each reduction of 0.01 percent below the specified maximum carbon content, an increase of 0.05 percent above the specified maximum manganese contetn is permissible, up to maximum of 2.0 percent. Grades A25, A, B, X42, X46, X52, X56, X60, X65, X70, and X80 shall conform to the tensile requirements specified in Table 3. Other grades intermediate to the listed grades between X42 and X80 shall conform to tensile ruquirments agreed upon between the purchaser and the manufacturer, and the requirements shall be consistent with those specified in Table 3. for cold expanded pipe, the ratio of body yield strength and body ultimate strength of each test pipe on which boldy yield strength and body ultimate strnegth are determined shall not exceed 0.93. The yield strnegth shall be the tensile stress required to produce a total elongation of 0.5percent of the gauge length as determined by an extensometer. When elongation is recorded or reported, the record or report shall show the nominal width of the test specimen when strip specimens are used and the diameter and gauge length when round bar specimens are used, or shall state when full section specimens are used. 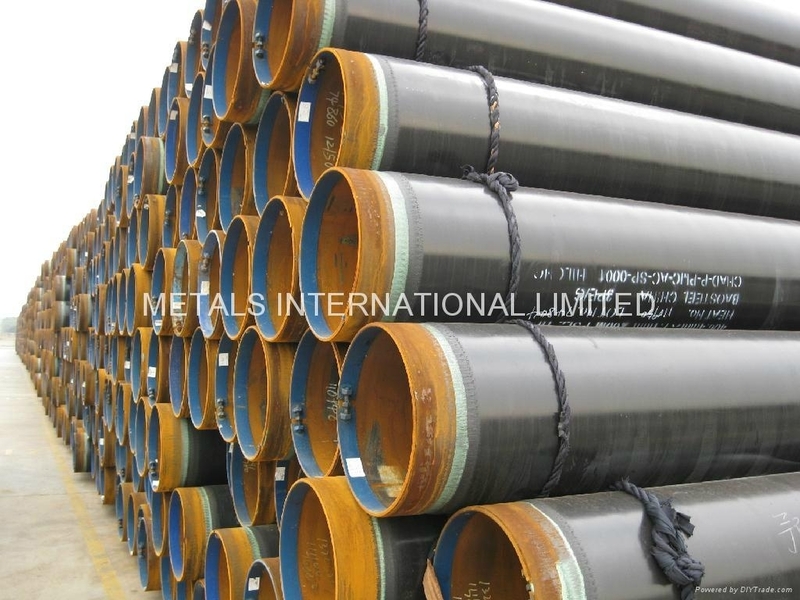 For Grade A25pipe, the manufacturer may certify that the material furnished has been tested and meets the mechanical requirements of Grade A25. a. electric welded pipe in grades higher than A25. for all pipe diameter diameter-to-thickness ratios(D/f), flatten to two-thirds of the original outside diameter (OD) without weld opening. for pipe with a D/f greater than 10, continue flattening to one-thid of the original OD without cracks or breaks other than in the weld. For all pipe D/t, continue flattening until opposite walls of the of the pipe meet; no evidence of lamination or burnt metal shall develop during the entire test. e = minimum elongation in 2 in. (50.80mm) in percent to nearest 1/2percent. A = cross-sectioinal area of the tensile test specimen in sq. in. (mm) based or. specified outside diameter or nominal specimen width and specified wall thickness rounded to the nearest 0.01sq. in. (6.5mm2) or 0.75sq. in. (484mm2), whichever is smaller. U = specified minimum ultimate tensile strength, psi, (MPa). See Appendix D for minimum elongation values for various size tensile specimens and grades. The minimum elongations for round bar tensile specimens [0.350 in. (8.9mm)diameter with 1.4 in. (35mm) gauge length, and 0.500 in. (12.5mm) diamter with 2.00 in (50.8mm) gauge length] shall be that shown in the Area A line of 0.20sq. in. in Table D-1, Appendix D.